If there is one thing which should have become perfectly clear to foreign journalists since the beginning of July it is that the entry of building supplies into the Gaza Strip – which was increased in recent years due to intense pressure from assorted international bodies and aid agencies – was abused by Hamas to construct cross-border attack tunnels rather than for the advancement of projects which would have improved the lives of the people of Gaza. 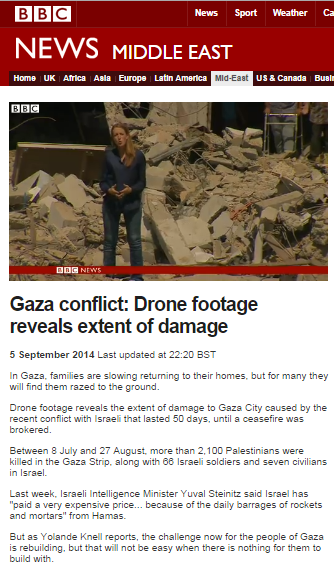 However, not only has the BBC shown no interest whatsoever in discussing Hamas’ misappropriation of those building supplies or the very serious subject of the accountability of the aid agencies and international bodies which were supposed to be supervising and guaranteeing the construction projects for which those materials were destined; it continues to present the issue in terms of “Israel says”. Knell’s report uses footage promoted on Twitter several days previously by the BBC’s Jon Donnison which shows the area of Shuja’iya where some of the most intense fighting took place and which – as we have noted here previously – is not representative of the situation in the Gaza Strip as a whole. 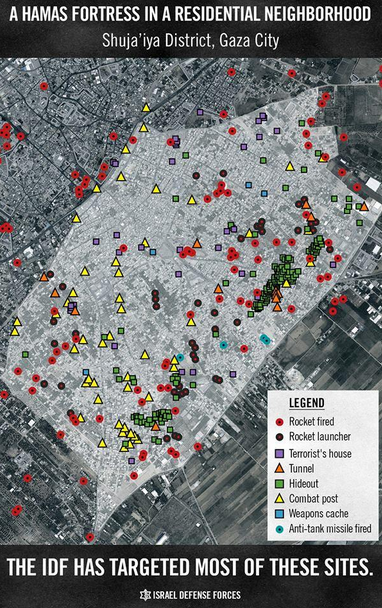 “The areas highlighted by the UN damage assessment report are compatible with the Israel Defense Forces briefings on the location of Hamas facilities, especially in the Shuja’iya area, which was the arena of the most intense battles. Knell, however, refrains from putting the images she wants BBC audiences to see into their correct context. Knell’s second aim in this report is to continue promotion of the now long-running BBC campaign on the topic of border restrictions. As has also been noted here previously, the Kerem Shalom crossing does not currently run at full capacity due to a lack of demand from the Palestinian side. What she refrains from clarifying to audiences is that a “political solution” which allows Hamas to import more weapons and to get its hands on supplies to build new tunnels will inevitably lead to yet another round of conflict in the Gaza Strip. It really is high time that Yolande Knell and her colleagues stopped their simplistic context-free PR campaigning on behalf of Hamas’ demand to ease border restrictions and began to fulfil their obligation to inform BBC audiences accurately and comprehensively of the real issues behind this story.